One shows three-year-old Princess Charlotte gazing adoringly into her baby brother's eyes and clutching his tiny hand, while their older brother Prince George, who will be five on Sunday, gives a cheeky grin and joins the rest of the family group looking at the camera. William and Kate, the Duke and Duchess of Cambridge have released official photographs from Prince Louis' christening on Monday 9th July. 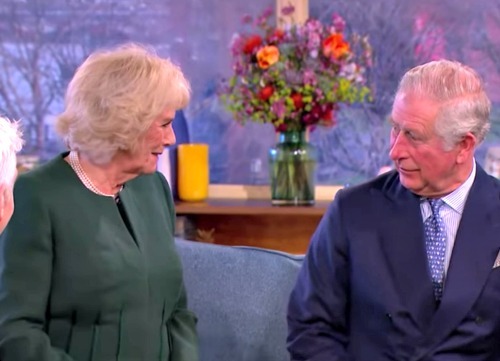 In attendance at the royal service was Prince Charles and Camilla Parker-Bowles, Prince Harry and his new bride Meghan Markle, Carole and Michael Middleton, Pippa Middleton and James Matthews, and James Middleton. Absent from the portraits are the Queen and Prince Philip, who are believed to have made a joint decision with Prince William and Kate not to attend as they were travelling back from Sandringham ahead of a busy week. The photographs, taken by photographer Matt Holyoak following the ceremony at St James's Palace, show the two-month old surrounded by members of the royal family in the Morning Room at the garden of Clarence House. Lucy Middleton - a cousin of the Duchess of Cambridge - read from St. Mark 10: 13-16 and Guy Pelly read Ephesians 3: 14-19. The third photo zooms even further, focusing on just Louis' immediate family-the Duke and Duchess of Cambridge and their three children, George, Charlotte, and, obviously, Louis himself. Duchess Meghan chose an olive Ralph Lauren dress and a hat by Stephen Jones for the christening, which was her first as a member of the royal family. A week after their youngest son's christening, the royal family have released a series of intimate portraits.